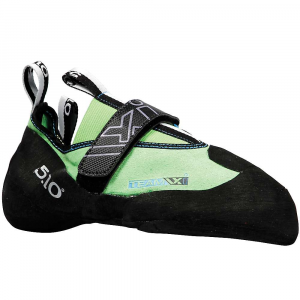 The Five Ten Team VXi’s are a highly specialized, performance climbing shoe. 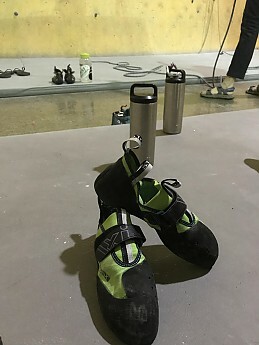 If you’re at a place in your climbing where you need a little boost to crack that latest project, these are like having a cheat code in your bag. 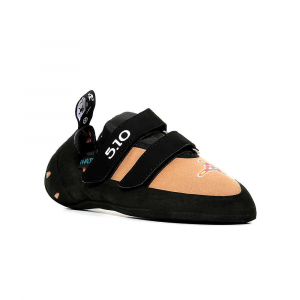 Boosting a full 360 degrees of the Stealth Mi6 makes these shoes excel at steep or overhanging routes. I’ve got very few constructive critiques. Other than a small break-in period, these are, in every aspect, a top performer. 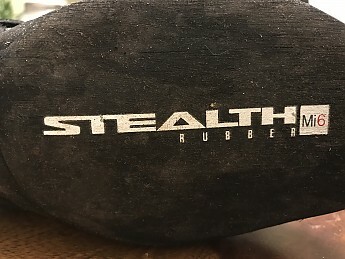 This entire shoe is built around the incredible Stealth Mi6 rubber which Five Ten originally developed for the Mission Impossible movie series. No, that’s not a typo. Tasked with designing a shoe that could stick to glass, you can probably think of the scene from Ghost Protocol, they started with their Stealth C4 rubber and had to reinvent the wheel. 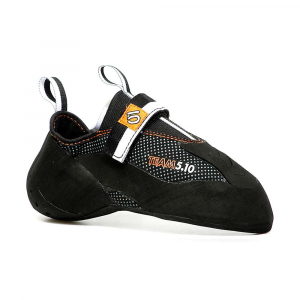 Softer and stickier than any rubber ever developed, the entire idea of a climbing shoe had to be revisited. As I mentioned earlier the Stealth Mi6 rubber is extremely soft and flexible. So rather than having to jam your feet into, and wrestle with, your shoes, these feel more like your favourite pair of broken-in leather boots. They mould around your feet and are able to take the shape of your foot rather than the other way around. These things weigh 10 ounces per pair! Again? 10. Oz. Per pair. 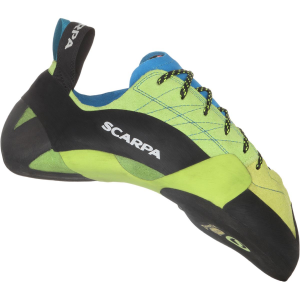 Most climbing shoes (as a general average) are only slightly less than that, per shoe. 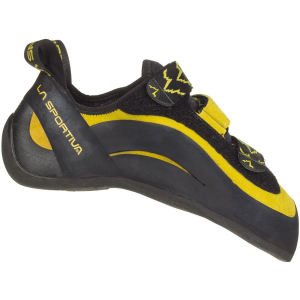 My La Sportiva Katanas weigh 8.7 oz EACH. 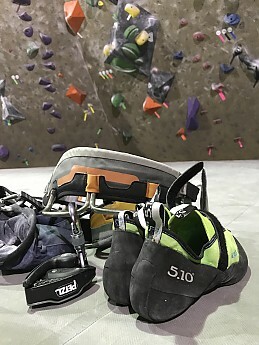 Five Ten claims they are the lightest climbing shoes made. I’ve never taken the time to compare them to every other shoe on the market but I’d believe it. This just adds to the feeling that your are climbing with nothing on. 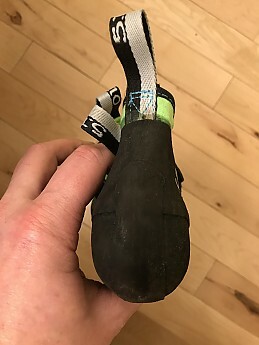 I can’t say I’ve ever noticed any other pair of climbing shoes' weight being a hinderance, but I also can’t say I’ve ever not noticed a shoe's weight as much. 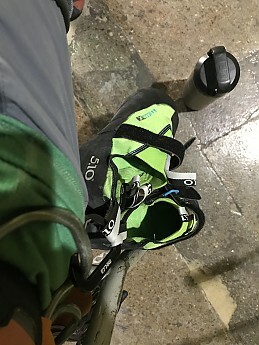 Especially when you are climbing outdoors it’s a surprising (hippy statement to follow) feeling of being connected to the rock. Every tiny jut or edge in the rock can be felt. 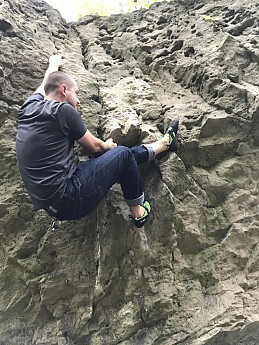 It leads to a much more aware style of climbing as it can be, if you're not paying attention to foot placement, painful. Similar to hiking in minimalist shoes where you feel all the pebbles. But, vertical pebbles. 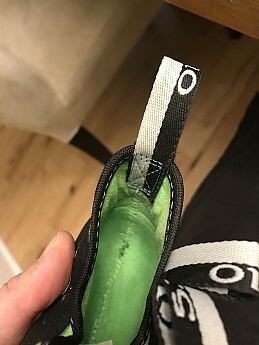 The stitching in the heel cup is aggravating at first, but nothing a few bandaids won't hide while your sweat softens it up. 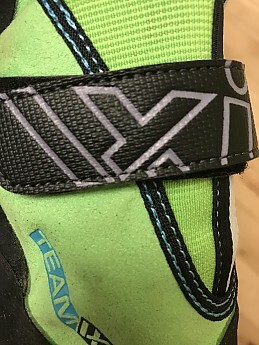 The shoe only has one Velcro strap over the foot. It doesn’t really need it though (for me, anyway) as it fits more like a slipper. Nice to have it I guess, but I’d be fine without it as well. That's more a case of it just fitting me perfectly. The heel cup is shallow, but I have tiny, ladies heels so it’s still a little too big for me. I’m definitely in the minority and think most will say it fits nice. It's not overly floppy on me, and doesn’t affect heel hooking or anything. As I’ve mention ad nauseam, the rubber used here outperforms anything you’ve ever used. 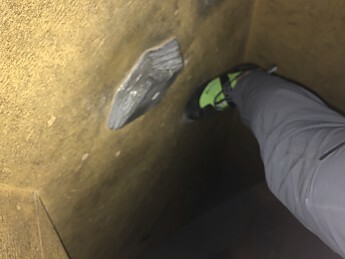 The Stealth Mi6 rubber used is incredible and luckily Five Ten was smart enough to just cover this shoe with it, 3.5 mm of it. It’s hard to write an entire review on a type of rubber but it’s really that impressive. 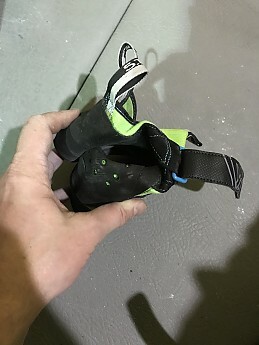 Having the rubber extend up over the toe makes this thing excel on toe hooking, probably the closest you’ll ever feel to Spiderman. You just have to blindly swing your foot at a hold and it sticks. No more technique. Technique is for suckers. Heel hooking’s the same. The rubber comes up a generous amount, almost just below your achilles. Place any of that space on even the most polished indoor “rock” and it holds. The Teams have a moderate downturned shape, not enough to be painful for long sessions, but enough to aid in performance. The thing that is different about these is that you can literally pull yourself in from the toes. 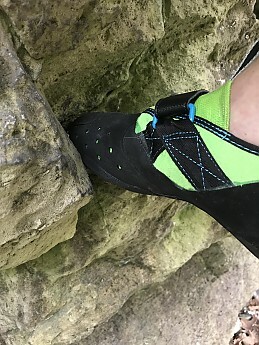 It changes the way you climb as this is not a normal option on most shoes. Most shoes edge by providing a stiff platform (sole, mid-sole) to stand on, these you can almost hold with your toes. It takes some getting used to at first with these, and it will work muscles in your feet you didn’t know you had, but it’s game changing. Having the stickiness of the rubber aids in the smearing ability as well. Most downturned shoes can’t smear very well, but these are above average because they will bend and allow you to make full contact between the rubber and the rock (also side note—that would be a cool name for a route, if I ever get to name my own route that’s gonna be it, copyrighted) (someone please tell me if that’s already been taken). These things excel when you’ve topped out. Like, physically. Not the top of a route. Between the price of them and the way I’ve fit them I just don’t use them as my beaters. If I’m working on a problem repeatedly I just don’t want to destroy these. They are not an everyday, every climb shoe to me. 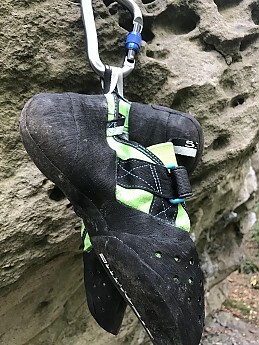 I like to work on a climb in my more comfortable, but far less performance Scarpa Force X’s, and then when you’ve found that crux move that you just can’t stick, bring out the big guns. More often than not they’ll stick the move and keep you going. While they will cram in nicely and aid you in any crack climbing you will certainly feel it. The tradeoff for that flexibility and sensitivity is that you’ll feel everything. So while in some shoes you have a firm buffer between your feet and the rock in these, it can get a little painful. It does, however, allow you to cram them into tighter spaces. Side, petty note—because everything sticks to this rubber, I’ve never seen a shoe that gets so dirty, so quickly. 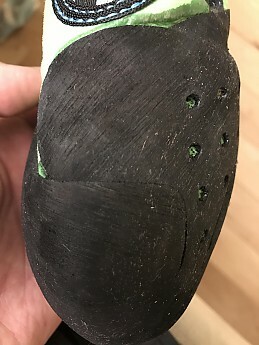 If you’re out bouldering and walking around between problems, the soles become dirty, quickly. 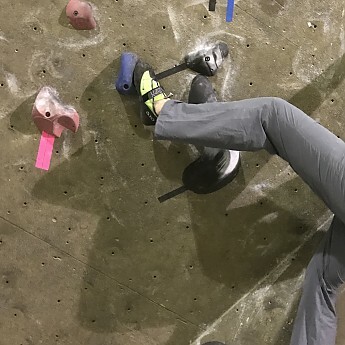 More than just a cosmetic thing it can greatly affect the performance if you don’t thoroughly clean them before climbing. How performance do you want to go? I went down from my normal shoe size 11 to a size 10.5. I would’t recommend going anymore than that. They were tight at first, really tight, but they’ve loosened up a bit. I’m not sure they’ve even stretched a half size, but they certainly feel like they have a little more give to them. They fit me perfectly now. Tight, but not painfully so. I’d say it took around 8-10 hours of wearing them to do so. One other note on fit. 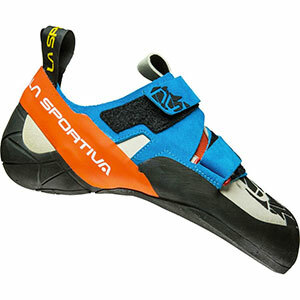 I lent them to a friend to climb who has wider, but smaller length feet, and he was unable to climb in them. So a caution to try them on before buying if you have wider feet, mine are skinny and they fit great. Unrelated to sizing (but I didn’t know where to put it), these things stink. This is not a problem unique to the VXi’s, or Five Ten even, but these reek. My fault, I know, but I’ve found a natural leather upper will stink “less”, and no, I’m not gonna wear socks with them—don’t be that guy. They are about average in terms of breathability, but I’m not sure I’ve ever found a shoe that my foot doesn’t sweat in. Any flaws that this shoe has is masked by the rubber. The smearing and edging shouldn’t be great, but it is. The weakest part of this shoe is my feet. 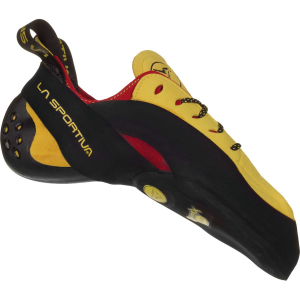 I generally keep two pairs of climbing shoes at any given time—a comfort, beater pair (the Scarpa Force X’s, they look like they’ve been through the ringer) and a performance pair (previously the La Sportiva Katana Lace, wonderful shoe, probably my…..second favourite ever), these will be one of them. 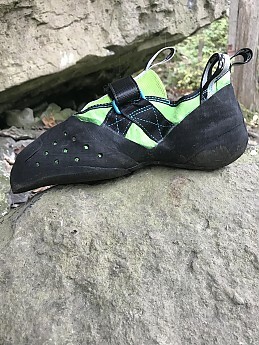 I’ve used these shoes for four months of climbing and bouldering. The Niagara escarpment I climb on is primarily magnesium rich limestone (dolostone) and shale. I’ve found the rubber to be relatively durable. You do trade a small amount of longevity for the softer rubber, but nothing abnormal. Aside from going from an awesome neon green to a more vomit green the rubber is still functional and looks to have seasons left in it. Aside from becoming dirty easily (I’m still waiting on the self-cleaning sole) and slight, initial break-in, I don’t know how I can give these anything but a glowing 4.5 stars. 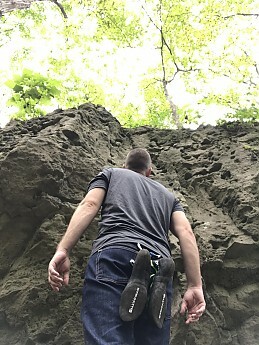 My thanks to Trailspace and Five Ten for the opportunity to test the Team VXi’s. Great review, Jake! Thanks for taking the time to test out these shoes so thoroughly. The Five Ten Team VXI is not available from the stores we monitor. It was last seen March 24, 2019	at Moosejaw.